Join Sarah Clark of Interconnected Yoga for a full weekend of Restorative Yoga Teacher Training. This training enables yoga teachers to expand their offerings with a solid understanding of Restorative Yoga, a very particular kind of practice that utilizes many props to sustain a relaxing yoga posture in an entire supported way. This practice helps refresh overall energy, soothe the nervous system, and calm the mind-body. The pillars of Restorative Yoga, clearly defining what it is and what its not. How to set up, teach, and practice Restorative Yoga Poses, including classic restorative savasana, supta baddhakonasana, side-lying savasana, restorative twist, and more. The specific benefits and contra-indicators of each Restorative Yoga Pose. Intelligent sequencing of Restorative Poses. How to evaluate an individual’s particular needs given their specific conditions & injuries as to offer the most fitting and beneficial Restorative Practice to them. A practice that will offer you, your group classes, and private clients a powerful tool to combat stress & fatigue, quiet the mind-body, and create a space in your life for renewal & healing. This training is for 200-hour (or above) certified yoga teachers, or teachers in training. Sat, May 21st 1:30-8:00pm (with 45 min break midway). Continuing Education credits via Yoga Alliance are available through Interconnected Yoga. 14 Contact Hours, plus 5 Non-Contact Hours for those who complete training AND the additional optional homework afterward. About Sarah Clark: Sarah is smitten by the many dimensions of a whole yoga practice- from ethics to asana to seated meditation. 15 years into her own practice, she is relieved to see that yoga and buddhist practices are like bottomless rabbit holes that seem to only go deeper over time. It keeps her curiosity piqued and gives her hope for the future of humankind.After completing her 200-hour training at OM Yoga Center in 2006, Sarah went on to teach an tremendous amounts of yoga mostly at OM Yoga Center, Dance New Amsterdam, New York University and privately. Ever the student, Sarah practiced yoga and meditation with the entire OM staff (particularly Cyndi Lee, David Nictern, Sarah Trelease, Christie Clark, and Joe Miller) & many special guests like Roshi Pat Enkyo O’Hara and Sharon Salzberg. She is certified in Relax & Renew® restorative yoga with Judith Lasater and her teaching was developed greatly by the guidance of Cyndi Lee. During this time Sarah participated whole heartedly in the modern dance community in NYC. On July 4th, 2011 she relocated to San Diego, CA and is continues a full public & private teaching schedule. Her asana classes are are alignment-based and breath-centric; they employ intelligent sequencing with an aim toward embodying mindfulness by balancing clarity with sensitivity. Sarah also created Interconnected Yoga Teacher Training in San Diego, and holds regular workshops on meditation, dharma, pranayama, and yoga teacher development. In her relocating westward, she began more intensively studying Canadian teacher Michael Stone; Sarah is deeply moved by his offering of the keen intersection of yoga & buddhist practices, insights of the west, and waking up in our daily messy lives. Sarah is still dancing, singing with her husband, and making mindful magic in the kitchen. 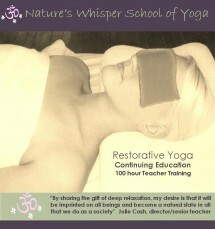 Nature’s Whisper Restorative Yoga Teacher Training is a 100 hour course and is open to current yoga teachers seeking deeper knowledge and certification.The training consists of 100 hours over a 3 weekend period designed to provide space for growth and integration. The ONE day a month “intensives” encourages deeper studies and offers self study for practicum. Each “Intensive” will be dedicated to an area of yogic practices which form a mandala of wisdom, intuition, knowledge and experience at the deepest levels of the body, spirit and mind as well as methodology and anatomy. 100 hours of study will be applicable to 500 hour certification.